In nature all animal and vegetable matter is broken down and recycled into plant food by enzymes and bacteria. BIO-CLEAN uses this same principal to biodegrade organic waste that accumulates in your plumbing system. Like all living things, bacteria must "eat" to survive. Fortunately the grease, hair, soap film and organic waste are food for the bacteria in BIO-CLEAN. The enzymes prepare this "food" for the bacteria by breaking down the large molecules into a size the bacteria can "swallow". When mixed with water, BIO-CLEAN immediately goes to work! The enzymes are very fast and start breaking down waste on contact. BIO-CLEAN contains billions of bacteria and as they eat, they double in number every 30 minutes! Unrestricted by gravity, they spread through the entire plumbing system, devouring all the organic waste. Waste accumulates in your pipes causing slow, or even clogged drains. Within days BIO-CLEAN begins to eat through the gunk, restoring drain flow to full capacity. Monthly BIO-CLEAN treatments will keep your drains clean and trouble-free. Authorized by U.S.D.A for use in federally inspected Meat and Poultry Plants. Why use BIO-CLEAN when there are already bacteria in my tank? Although some bacteria are present in the waste these organisms do not work well on protein, fiber and grease. Futhermore, modern chemistry has provided us with advanced cleaning products made of complex molecules. Ordinary bacteria just can't break these chemicals down. Bio-Clean is specially formulated to bio-degrade ALL types of organic waste. 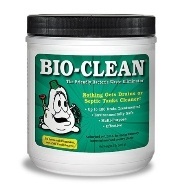 Bio-Clean contains a larger quantity, a higher quality and a unique combination of ingredients not found in other septic tank products. In fact, Bio-Clean can even restore failing septic fields in most cases.